Once again, I decided to observe Homegrown Fridays, eating only what I’ve grown on the Fridays in Lent. Anything you see in bold followed by * is listed on the Recipes page of this blog (click on the recipe tab at the top). This year was more of a challenge because of other commitments. I started two weeks early so I could get in seven Fridays and even at that, two of the Fridays were actually Thursdays. I finished early so that I could be off on another adventure. If you’re reading this the first week in April, 2012, I’m at Tillers International in Michigan finding out more of what they do there while my husband is taking a class in timber framing. The delicious dinner you see in the photo was one of my meals. It consisted of kale harvested fresh from the garden, Arkansas Razorback cowpeas, and three varieties of sweet potatoes–Ginseng, Beauregard, and purple. When I have no “homegrown only” restrictions, I would probably put butter on the cowpeas and sweet potatoes and vinegar on the kale. I enjoyed the natural flavors of that food without butter and vinegar. I had dried a variety of things in my solar food dryers last summer and had looked forward to using them for Homegrown Fridays this year. I made a soup using as many of them as I could*. Dinner one Friday was polenta topped with tomato sauce*. Cooked Mississippi Silver cowpeas accompanied that meal. Polenta is just another name for cornmeal mush that has been cooked a little longer and let set to thicken. I cooked it in a crockpot the day before, then put it in the refrigerator. At dinnertime I put tomato sauce over it and heated it in the oven. When I cooked the cornmeal and water for polenta, I added dried onions. I froze some, which made an easy lunch to heat up on another busy Homegrown Friday. 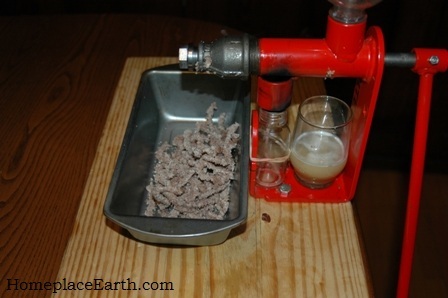 I was fortunate to have peanuts this year and made peanut butter for the first time in my GrainMaker mill. 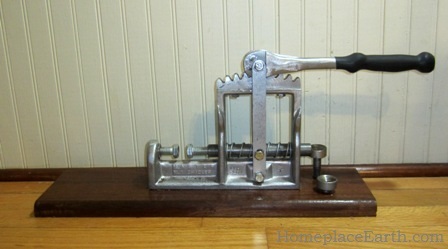 I had better luck grinding raw peanuts than grinding roasted peanuts to make peanut butter. I made it twice and, although I’m sure I’d get better at it with practice, it’s a whole lot easier, and less cleanup, to just eat the peanuts as they are. The folks in Biosphere 2 grew peanuts with the intent to press them for oil, but decided to just eat them as a snack. Peanuts were one of their main sources of fat. Their two year experiment with eight people living in a completely sealed environment and producing all their food is documented in the book Eating In: From the Field to the Kitchen in Biosphere 2 by Sally Silverstone. I made peanut butter to have with carrots from the garden. That day I also made sorghum crackers. Recalling a recipe for greens in peanut sauce from the cookbook Simply in Season, I made a version of that with my dried collards. I put peanut butter with the dried collards and water while it cooked. We ate it as a vegetable for dinner, but I liked it better as a sandwich filling for a meal another day. It would have made a good dip. I made “bean burgers” for the first time. It’s something that’s long been on my “to-do” list. 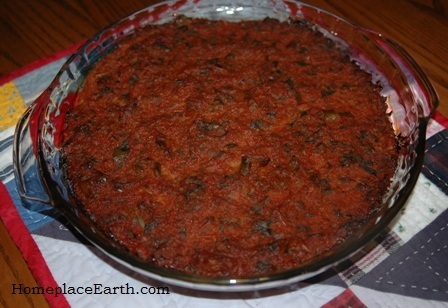 I used cooked cowpeas, reconstituted dried onion and dried sweet pepper, and minced garlic. The cowpeas were boiled until really soft. 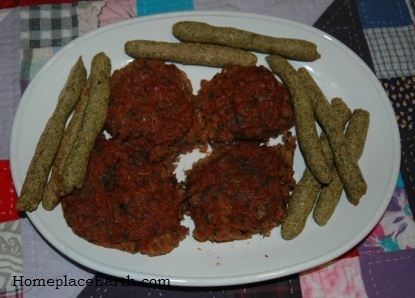 I mashed everything together and made it into patties that I topped with tomato sauce and baked. Breadsticks made with sorghum flour were served with that. One day lunch was home-canned green beans cooked with dried cabbage and onions. Sorghum patties (made like corn patties*) rounded out that meal. A couple lunches were sweet potatoes, peanuts, and raisins. Peanuts, raisins, and popcorn were great to have among my choices of homegrown food. 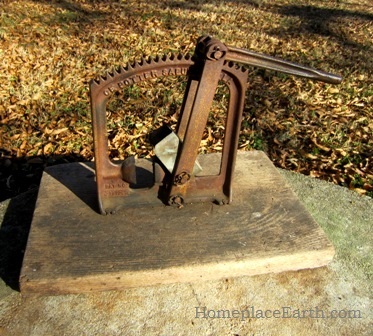 Last summer I dried grapes for raisins by cutting the grapes in half and drying them in the solar dryers. The seedless grapes were best for that. Popcorn was popped in a pan with no oil for a snack some days. Just be ready to shake the pan a lot to prevent burning. When limiting your diet like this, it is good to plan for something quick to eat if you are really hungry and you still have to plan dinner. Peanuts, raisins, and popcorn filled that need nicely and could be taken along if I had to be gone somewhere. Breakfast was the easiest meal and always the same. I had cornmeal mush made with my Bloody Butcher Corn. 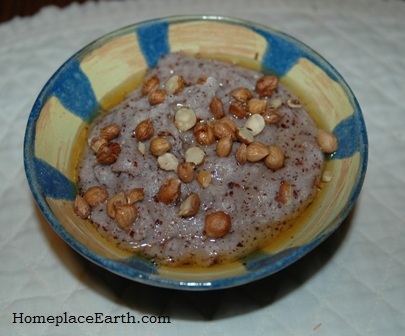 I sweetened it with honey from my bees and added hazelnuts, which were great. 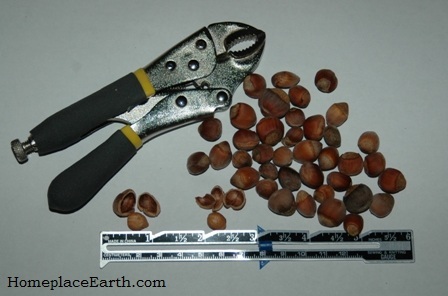 You can read about my hazelnut harvest in my last post. My black walnut trees seem to bear alternate years and didn’t drop nuts in 2011. 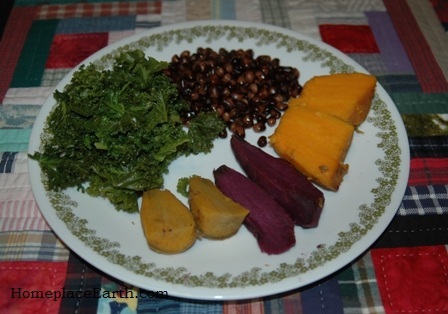 The staples in this homegrown diet are cornmeal, sweet potatoes, cowpeas, and greens. I had sorghum and wheat for additional flour and the dried vegetables were much appreciated, especially tomatoes and onions. I had some naturally fermented sour pickles and garlic that I chopped up and added to cowpeas for lunch one day. Herbs, dried and fresh, add diversity to the flavors. I was happy to harvest fresh celery leaves in the garden. The parsley I used was dried. Eating this way makes you really appreciate each additional flavor and texture. You might be interested in reading about my 2011 Homegrown Friday experiences. I drank water or herb tea. Currently my herb tea blend consists of spearmint, bee balm, lemon balm, and basil. On these Homegrown Fridays my husband and I often opened a bottle of mead made from our honey and grapes or elderberries. We feel very fortunate to have such bounty from our garden. At the same time, we are mindful of those in the world who don’t know where their next meal is coming from. We hope that our work here will help towards the understanding of what it would take to feed others. The learning is in the doing. I hope some of you will try a Homegrown Friday or two at any time of the year. It is definitely an experience. In the spring of 2007, I planted hazelnut trees on the north border of my garden. Last fall, a short four years later, I began to harvest the nuts. Not all the trees were bearing, but enough were so that I could enjoy a nice harvest and work out the details of what to do with them. There may be a slight difference between hazelnuts and filberts. One source referred to the varieties native to the U.S. as hazelnuts and the European varieties as filberts, however I’ve seen the words used interchangeably. For clarity, I’ll just refer to them all as hazelnuts and specify if I mean American or European varieties. I have seventeen trees each planted 4 feet apart. The nuts grow in clusters on the trees, as shown in the photo. It was exciting to watch them develop over the summer. I had heard that squirrels often take them, so I watched carefully into September. I didn’t want them to fall to the ground because I was afraid I would lose them. As the clusters dried on the tree I pulled them off. If they needed further drying I put them in the solar dryers. The harvest began October 9. At first I stored them in baskets in a cool room in the house. Having them in clusters insured that there would be some air circulation. Eventually I got around to threshing them out of the clusters by putting them in a pillowcase and hitting it with a stick. 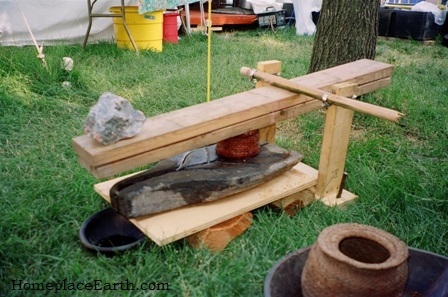 I use that same procedure to separate dried beans from their hulls. After threshing I stored some hazelnuts in a crock-type “cookie jar” in my pantry. (It came to my kitchen second-hand and actually says “Cookies” on it.) The rest were put into a pillowcase and hung in the barn to keep safe from mice. The nuts still need to be shelled before eating. These hazelnuts are smaller than the shelled nuts you will find in the health food store. In fact, they were too small to use with a regular nut cracker, so I resorted to using a hammer to crack them open. That worked, but often I hit too hard and also smashed the nutmeat. My solution was to use vice-grips (locking pliers). I could set the screw on the end of the handle so that the pliers would close to just the right space, cracking the shell but not the nutmeat. 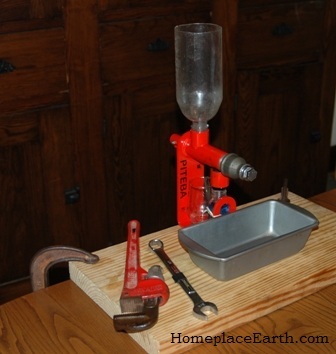 At first I borrowed the vice grips from our workshop, even though they were a little big for the job. Santa brought me a smaller pair that I keep in the kitchen and are dedicated hazelnut crackers. From the photo you can see that some nuts are much larger than others. The trees with the largest nuts seemed to have fewer clusters. There were anywhere from 2-9 nuts in a cluster. The largest nuts were in the clusters containing 2-5 nuts. 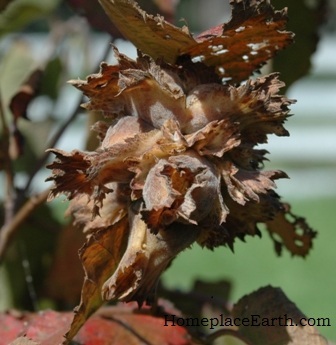 My trees are American hazelnuts, Corylus americana, which are native to the Eastern U.S. and Canada. Of the hazelnuts you find in the stores, 99% are grown in Oregon and are European varieties. European hazelnuts are not quite as hardy as C. americana, but produce larger nuts. They grow well in the Pacific Northwest where they were thought to be safe from the eastern filbert blight…..until they weren’t. Eastern filbert blight is now in the western states. As a result, Oregon State University has bred some European hazelnuts that are resistant to blight. Rutgers University also has a breeding program for resistant varieties, hoping to bring commercial hazelnut production to the eastern states. 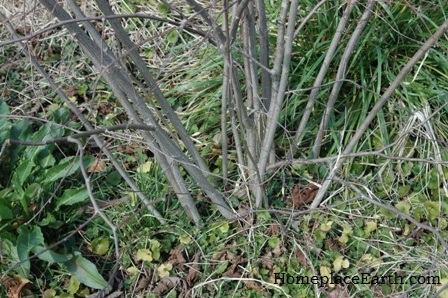 Eastern filbert blight is not a problem with C. americana. I bought my hazelnuts as seedling trees from the Virginia Department of Forestry, however, a quick online check shows they don’t offer them anymore. Yes, some of the nuts were quite small, but some are fairly large. All are tasty. According to my favorite garden book, How To Grow Fruits and Vegetables by the Organic Method, edited by J.I. Rodale, if you find a native hazelnut tree in the wild that produces large nuts, dig the suckers and grow them out in your garden. If you have one that you would like to propagate, and not go digging around, you can just bend the sucker to the ground. Peg it there or put a rock on it, leaving a few inches of the tip sticking out. Roots will grow and the following year you can dig that new plant to put elsewhere. It will have the characteristics of the parent plant. You can also propagate by planting the nuts. That method will give you about a 70% chance of having the same characteristics as the parent. I think I will pay attention and try my hand at propagating my more desirable trees by layering the suckers. Although you will find both male and female flowers on the same tree, hazelnuts are not self-fertile, so you need to plant at least two trees within 50 ft. of each other for wind pollination. 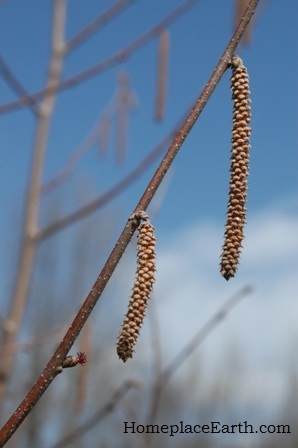 The male flowers are actually catkins that are more noticeable hanging from the branches. The female flowers are tiny and can be found growing right along the branch. You can see both in the photo. Some varieties of hazelnuts are designated as producers and some are pollinators. The pollinators will produce nuts, just not as many as the producers. I chose hazelnuts for my garden border because I wanted something taller than garden plants for a north windbreak. I would have considered putting grapevines there, but it is a wetter area and grapes need a dry spot. What I read at the time indicated that hazelnuts could stand the wet soil, however in doing research for this post, everything I see says they need a well-drained spot. They seem to be doing well in my garden and we’ve had a wet year. I used closer spacing because I was going for a hedgerow. Orchard plantings, of course, would be further apart. In permaculture we always think of plantings that can fill multiple niches. Hazelnuts naturally grow as a shrub with multiple stems. As they age, more suckers come. I assume that I will eventually have to prune some of them out. That will provide basket-making material and fuel for my rocket stove. Nuts to eat, baskets, fuel, a nice looking border, and a windbreak all from one planting! Apparently hazelnuts can be pruned to tree form from the beginning, rather than having multiple stemmed shrubs. You would have to clip out the suckers when they are dormant early on in the life of the tree. One internet source I read mentioned spraying the suckers with herbicide! I’d rather learn to manage the hazelnuts as they naturally grow and find uses for extra suckers/stems. In commercial production the tree form is more desirable because it makes machine harvesting easier. They let the nuts fall to the ground and pick them up with their machines. That means they need a clean orchard floor. I don’t even want to think about how they control the vegetation under the trees for the harvesting to go smoothly. The American hazelnuts, which grow to about 10 ft., are a little shorter than the European varieties. Mint, clover, and grass grow under my trees. If the nuts fell to the ground, I would have to go searching for them, unless I kept that area mulched, or put out tarps or old sheets. The nuts are actually mature before they fall out of the clusters and I found that it was easy to harvest the clusters on the tree as they ripened. I wonder if easily falling out of the clusters is a desirable trait in the commercial varieties. I would think so, although not a good trait in my garden. I hope you add hazelnuts to your permaculture garden. They are quick to mature, a good addition to your diet, and provide materials for other projects. My next post on April 3 will be about my Homegrown Fridays this year which have included my own hazelnuts.